In the reach out and touch someone department, Tom Petty isn't about to list them as his favorite phone calls. They were the calls he made last year to the other members of his band, the Heartbreakers, to tell them that after 14 years together, he'd decided to make a solo album. "They weren't really overjoyed about it," Petty, 37, said by telephone from his manager's Los Angeles office. Who could blame them? 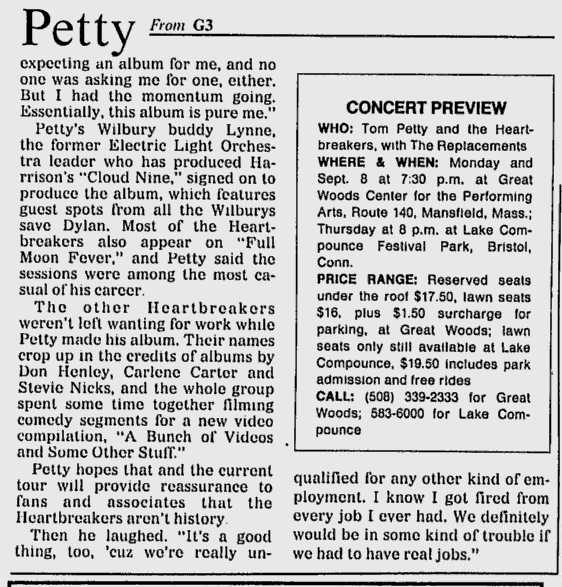 Petty's name has been out front since the start, and the quintet had just settled down after going through some rough intraband turmoil during the mid-'80s. For additional anxiety, Petty joined another band, albeit a temporary unit. It was the all-star Traveling Wilburys, whose ranks also boasted Bob Dylan, George Harrison, Roy Orbison and Jeff Lynne. Petty's bandmates couldn't help but wonder if their leader was breaking up those Heartbreakers of his. "They probably just wondered if I was quitting or not," Petty said. "I tried to reassure them that I wasn't. And I wasn't." That's the truth. The Heartbreakers were back together by the time Petty's "Full Moon Fever" was released in the spring, trumpeting their return with an exuberant performance on the season's last episode of NBC's "Saturday Night Live." That provided the launch for this summer tour, which finds Petty, guitarist Mike Campbell, bassist Howie Epstein, keyboardist Benmont Tench and drummer Stan Lynch romping around the United States and playing their particular brand of guitar-drenched rock 'n' roll that flaunts influences from Elvis Presley to the Beatles to the Byrds. They're finding themselves a hotter draw, too, after a commercial lull during most of this decade. Petty's "Full Moon Fever" is a Top 5 album, and album-rock radio -- his traditional bailiwick -- is pumping songs like "I Won't Back Down," "Running Down a Dream," and "Free Falling" onto their playlists. Whether the Wilburys will work again is uncertain due to Orbison's death last December, but Petty said he'd certainly jump at the chance to work with the others again. "The neat thing is I can view them as my friends," Petty said. "They're great musicians, with so much to offer and so many things you can learn and pick up. You realize that they're people just like you, but when you do think about it, it's a great honor to work with them." Though there are similarities in the sound of the Wilburys album and "Full Moon Fever," Petty actually started his album before the supergroup formed. He didn't plan a solo record; it cropped up after he came off the road in late 1987 from three successive years of touring. "I started writing some songs," he said, "and I went into the studio to try them out and they sounded so good that I said 'I think I'll just keep on doing this.' I ended up in the middle of it, really. "I suppose I could've done this album with the band, but it was just the circumstances that led to a solo album. Once things were under way, I didn't want to stop for any reason. There was nobody expecting an album for me, and no one was asking me for one, either. But I had the momentum going. Essentially, this album is pure me." Petty's Wilbury buddy Lynne, the former Electric Light Orchestra leader who has produced Harrison's "Cloud Nine," signed on to produce the albums, which features guest spots from all the Wilburys save Dylan. Most of the Heartbreakers also appear on "Full Moon Fever" and Petty said the sessions were among the most casual of his career. The other Heartbreakers weren't left wanting for work while Petty made his album. Their names crop up in the credits of albums by Don Henley, Carlene Carter and Stevie Nicks, and the whole group spent some time together filming comedy segments for a new video compilation, "A Bunch of Videos and Some Other Stuff." 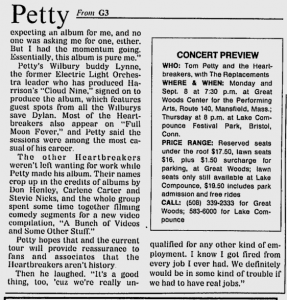 Petty hopes that and the current tour will provide reassurance that the Heartbreakers aren't history. Then he laughed. "It's a good thing, too, 'cuz we're really unqualified for any other kind of employment. I know I got fired from every job I ever had. We definitely would be in some kind of trouble if we had to have real jobs."